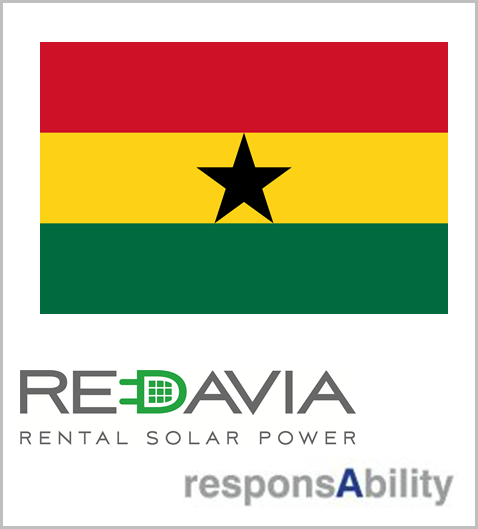 Solar technology company REDAVIA and the responsAbility-managed climate fund have signed a financing agreement for REDAVIA’s Ghanaian subsidiary. The $4 m financing will allow REDAVIA to supply Ghana’s industrial and commercial sector with affordable, reliable and clean power generated through modular solar farms. Germany-based REDAVIA offers solar power for businesses and communities in Africa through subsidiaries in Ghana, Tanzania and Kenya, and has a proven track-record in solar farm design, manufacturing, deployment and maintenance. The company targets the local business community including agrofoods processing, manufacturing, public infrastructure, hospitality & real estate companies and mining & minerals. REDAVIA solar power enables a seamless integration into the existing electricity infrastructure of a business to ensure a more cost-effective, reliable and cleaner energy mix – with diesel generators, in a battery set-up or as a complement to grid-connected power. As such, REDAVIA is supporting the reduction of carbon emissions and increasing the impact on a sustainable society.